This section introduces the growth and development of Chinese American philanthropy. Historically, the first Chinese immigrants came to the United States during the California Gold Rush in the 1850s and played a critical role in the construction of transcontinental railroads through the 1880s. In response to growth in numbers and subsequent anti- Asian sentiment, the Chinese Exclusion Act was passed in 1882, limiting Chinese immigration to the United States. The elimination of discriminatory immigration quotas in 1965 brought renewed immigration from China, which continues today. Currently, the United States Census Bureau estimates that there are over four million Chinese Americans, which is approximately 1% of the nation’s population. 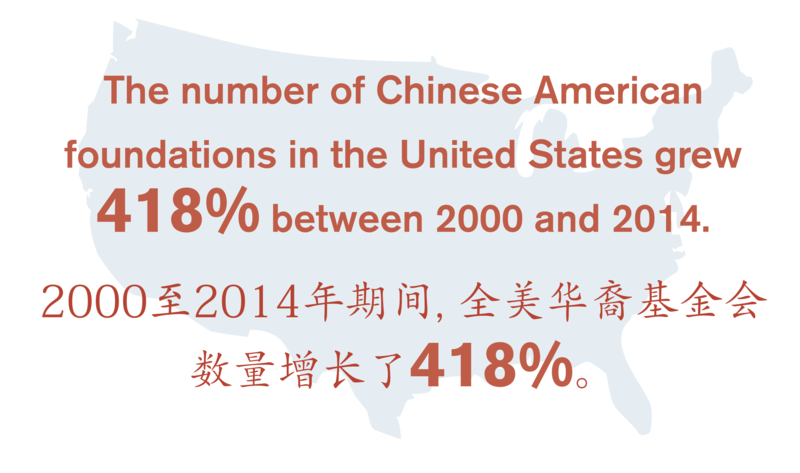 Between 2000 and 2010 alone, the Chinese American population grew disproportionately at 39% while the country’s total population increased at only 10% within the decade. Chinese American per capita income exceeds that of the total population (USD 30,061 to 27,100 [RMB 183,372 to 165,310] according to 2009 American Community Survey 3-Year Estimates) with businesses owned by Chinese Americans creating nearly a million jobs in the United States and issuing nearly USD 30 billion (RMB 183 billion) in payroll; it should be noted, however, that 12% of Chinese Americans nationwide live below the poverty line. 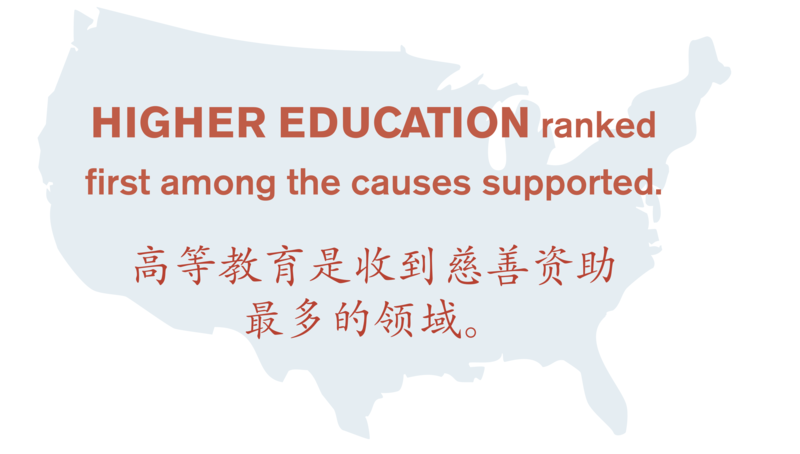 As Chinese Americans have played a vital role in growing the U.S. economy, so has their philanthropic giving—currently, there are nearly 1,300 Chinese American foundations in the United States, growing over 400% between 2000 and 2014. 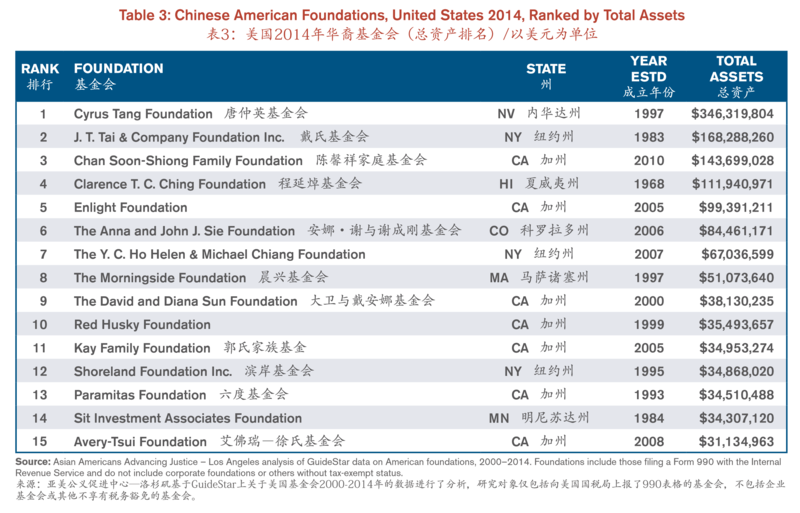 The number of Chinese American foundations in the United States is growing dramatically. 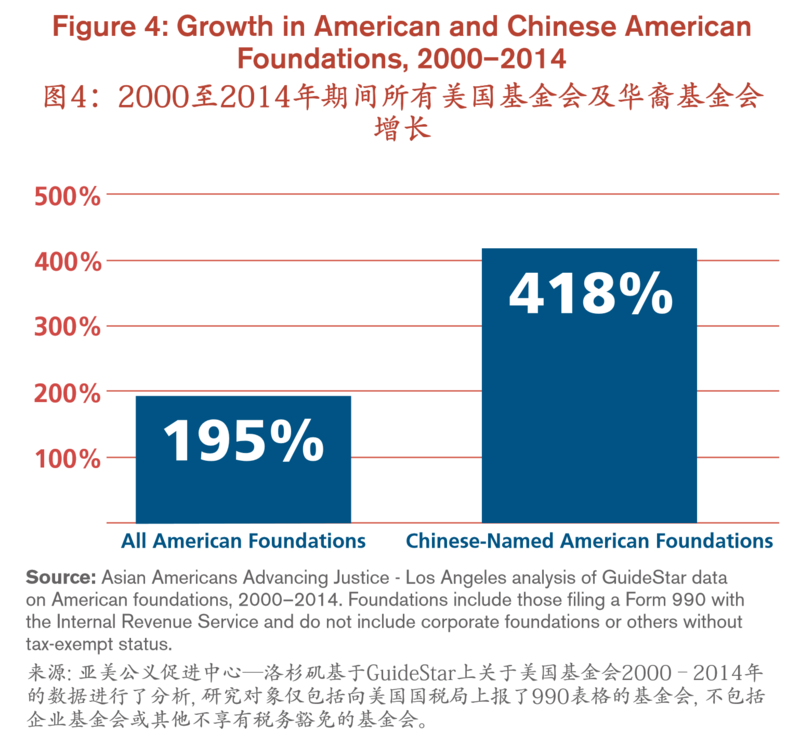 Between 2000 and 2014, the number of Chinese-named American foundations grew 418% (Figure 4). In contrast, the number of all American foundations grew 195%. 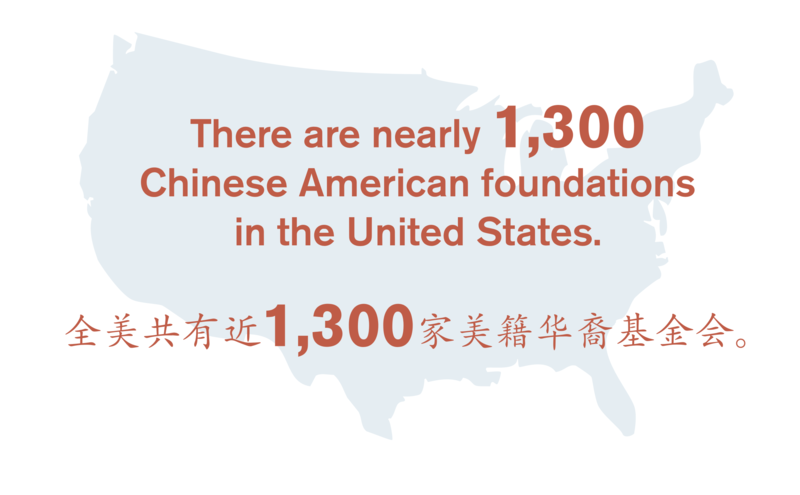 Given this tremendous growth, Chinese American foundations tend to be more recently established. Over 80% were established in the year 2000 or later. 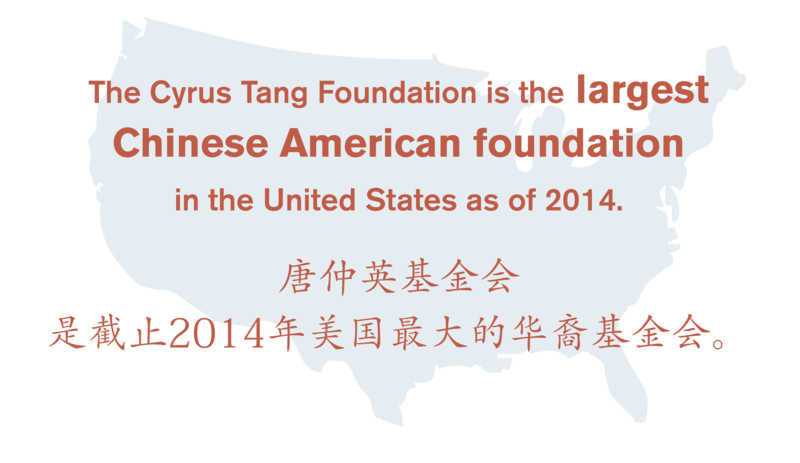 The Cyrus Tang Foundation is the largest Chinese American foundation in the United States, with total assets of over USD 346 million (RMB 2.1 billion) (Table 3). Four Chinese American foundations have assets of over USD 100 million (RMB 610 million), including the Cyrus Tang Foundation, J. T. Tai & Company Foundation, Chan Soon-Shiong Family Foundation, and Clarence T. C. Ching Foundation. 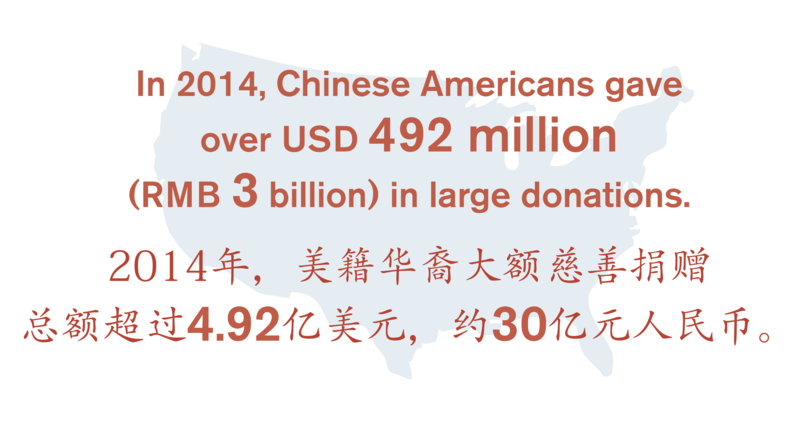 In 2014, Chinese Americans gave over USD 492 million (RMB 3 billion) in large donations. The amount was nearly five times that given in 2008, which saw over USD 99 million (RMB 604 million) in large gifts (Figure 5). Of large gifts from 2008 to 2014, Chinese American giving was about proportional to their representation in the U.S. population (1.17% of giving versus 1.23% of the U.S. population). 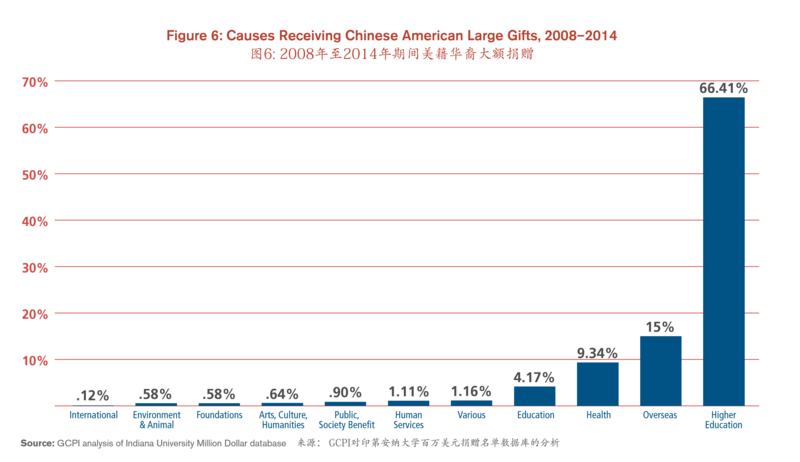 According to the Million Dollar List database from Indiana University (2008–2014), among the USD 1 million (RMB 6.1 million) or more large gifts from Chinese Americans, higher education ranked first by far as the primary cause for giving, capturing 66% of large gifts donated (Figure 6). Gerald and Ronnie Chan’s Morningside Foundation pledged USD 350 million (RMB 2.1 billion) to Harvard University’s School of Public Health in 2014 (Table 4). (Large donations are often distributed over time and may exceed a foundation’s total assets in a given year) At the time, the gift was the largest in the school’s nearly 400-year history.